Held at the Royal Institution of Great Britain. Chaired by Paddy O'Connell, who was living and working in New York on 9/11 and anchored the New York end of the special programme that night for BBC One. Isabel Hilton, international journalist and broadcaster and editor of chinadialogue.net. Mehdi Hasan, senior editor (politics) at the New Statesman and a former news and current affairs editor at Channel 4. Carne Ross, a former British diplomat, author and journalist. Maajid Nawaz, co-Founder and executive director of Quilliam. 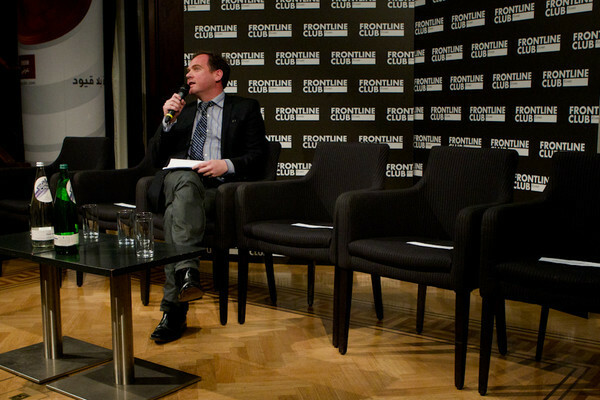 Michael Goldfarb, author, journalist, broadcaster and GlobalPost's London correspondent. Paddy O'Connell talks to the audience before the discussion starts.